The Main Characteristics of Turbine Meters For Gas - SILVER AUTOMATION INSTRUMENTS LTD. The turbine meters for gas possesses many advantages like high accuracy、good repeatability、simple structure、less moving parts and resistance to high pressure. Moreover, its measurement range is wide and its size is small、its weight is light and it has small pressure loss. What’s more, it is handy to be repaired. It is used in sealing pipes to measure the volumetric flow and total amount of low viscosity gas. In addition, it has a wide use value in many fields including petroleum、chemical industry、metallurgy and pipe network of gas in the city. 1. 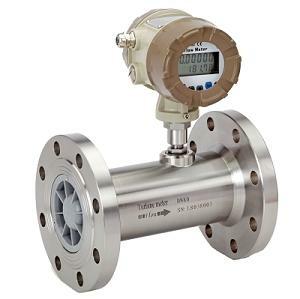 It has wide measurement range and its flow rate of the lower limit is less than 0.5m/s. It has small pressure loss and its impellers have a strong resisting capacity of impacting. 2. It has an excellent capacity of resisting electromagnetic interference and vibration, which adopts full sealing insulation blocking and maintenance—free bearing. What indicates is that it has a reliable property and long service life. 3. It adopts the advanced monolithic microcomputer technology which is ultra power consumption. The function of the whole machine is strong and the power consumption is low as well as it has superior performance. Also, it has no linear accurate compensating intellectual flow indicator. Its accuracy is better than ±0.02%. 4. The coefficient of the instrument can be set by key online and it can be displayed on LED screen. The screen is audio—visual and clear, which proves its high reliability. 5. It applies EEPROM to have a power fail safeguard for accumulative flow and coefficient of the instrument. The quad time is more than ten years. 6. It can be going to compensate when the measured gas is in a steady state of pressure. Flow meter is one of the composing parts in measuring science and technology. it has a closed relationship with national economy、national defense construction and scientific research. To use flow meter correctly is very important for the production and development of companies. If you have any other questions and problems about flow meter, you can contact SILVER AUTOMATION INSTRUMENTS LTD— gas flow meter manufacturers. We are willing to provide you with the best service.